Yup folks. That picture of Chan Yung-Jan says it all. 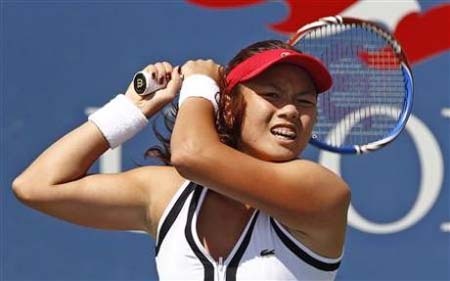 Asia's failure to get a single player into the fourth round of either the men's or women's draw at Flushing Meadows is a disappointing outlay bearing in mind the promise shown of late by a growing hotbed of tennis talent. Yeah...a growing promise of tennis failure. Sure, it's the Junior US Open - but c'mon - how many of you ever played in a US Open period? Exactly - so you should take what the tennis world gives you and that's sixteen year-old Chanelle Van Nguyen who's made it past the two qualifying rounds, won her first round and is now on to the second at the grandstand (and apparently she also just came off an abdominal injury, which just means that she's a lot tougher than you or I). And front page Nguyen (when you click on the US Open main page on the Upcoming Matches tab)? Well - that's a lot better than Asian FAIL.